Join Eric Jensen for a virtual workshop that gives you easy-to-implement classroom strategies. 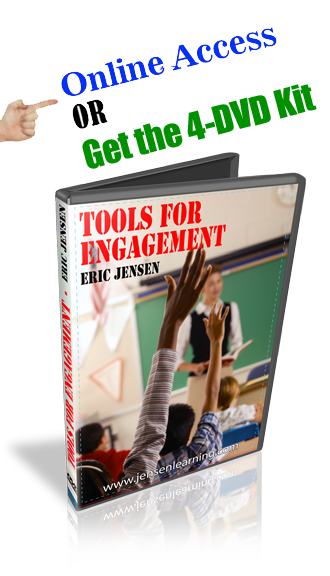 The sample 5-minute video gives you a taste of what to expect from Eric Jensen, as he delivers a compelling and captivating session to teachers who want to fully engage their students. Now You Can Get a Huge Savings! Instant Online Access, PLUS Highly Practical and 100% Guaranteed! It can be done at your school. You can have an engaging high performance school. But it all starts with your staff. Give them the tools and the support and you can make it happen. You can boost student learning and achieve greater success every day. But you have to take action. Succeeding at your school will take resources. No one is saying, “This is easy.” It’s not. 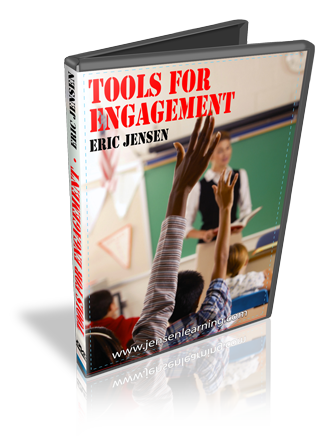 You can bring Eric Jensen to your school, do a book study with the staff or you can have a permanent and compelling in-house resource to use again and again, for one low price. How? 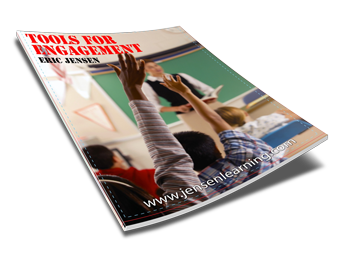 Get instant access to amazing “Tools for Engagement” video presentations. POWER SESSION #1: • Role modeled Examples • How to Get “Buy-in” • Best Ways to Get Attention • How to Re-group & Socialize • How to Give 100% Better Directions that Student Follow Every Time. POWER SESSION #2: • Role Modeling • The Biggest Secret Ever to Huge Engagement • How to Read and Change Student States • Best Ways to Manage Your Own State • Using Peer Teaching and “Nudges”. POWER SESSION #3: • Why Use Templates Not Strategies •How Students Can Make Progress on Walks • Using Kinesthetic Arts to Engage • The Power of “Quick Writes” • The 3 x 3 Grid Template • Engage with Activated Listening • Better Scavenger Hunts • How to Use Music Better. POWER SESSION #4: • Climate Counts (How to Ramp it Up) • The Use of Social Prompts for Accountability and Engagement • Fresh Graphic Organizers • How to Use Student Motivating “Drivers” • Quick Responsive Affirmations • Better Class Jobs • Instant Energizers • Think-Choose-Act Activities • Get an Unstoppable Engagement Attitude. You’ll find 27 video lessons within the 4 Power Sessions. Take action now to get four (4) powerful staff development presentations. You can now soak in the cutting-edge content over and over for maximum learning. *Online accessible, DVD Option Available. “Do it! Even if you’ve taught 30 yrs. you will learn or refresh. If you’re a new teacher this is priceless! The sooner your staff “buys in” to: 1) that change is possible 2) that change is necessary right now 3) the new science-based vision for change and 4) the accountability to make it happen, the better. Every day counts, you must act today! Your staff and your students NEED CHANGE NOW! YES! I want to get top quality help, get our staff on board this year and start seeing results F-A-S-T.
PAYMENT: VISA, MASTERCARD, and AMEX cards welcome. I want to get top quality help, get our staff on board this year and start seeing results F-A-S-T.